December 4, 1927: The first of t two-day engagement for Judy and her sisters, “The Gumm Sisters,” at their father’s theater in Lancaster, California. December 4. 1929: “The Gumm Sisters” performed for the Kiwanis Organization’s dinner in Los Angeles, California. 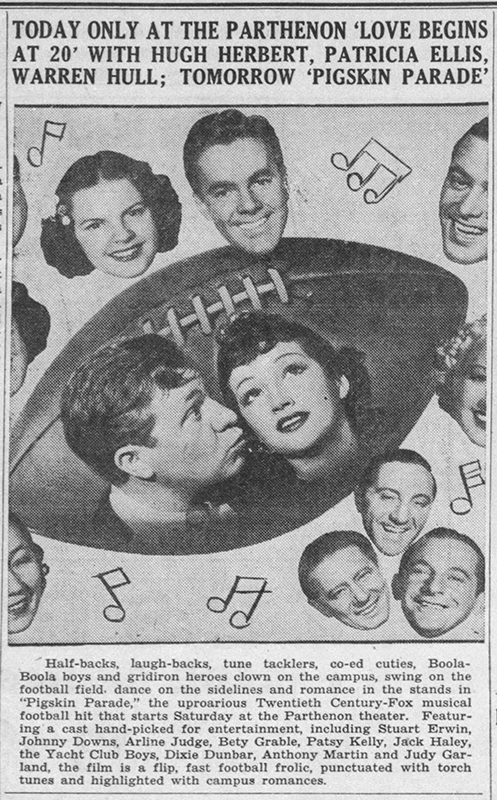 December 4, 1936: Still in theaters and still doing great business was Judy’s very first feature film, Pigskin Parade. 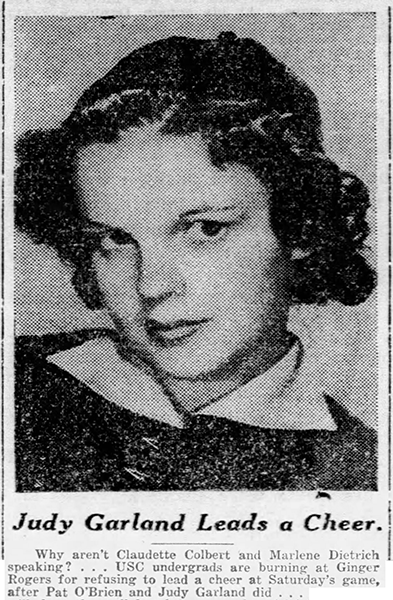 December 4, 1937: Judy apparently attended the USC football game on this date, as reported by Ed Sullivan in his column a few days later. December 4, 1939: Judy and her sister Sue recently visited a girl in the hospital in Santa Ana, California. The visit must have been arranged and sanctioned by MGM judging from the copy accompanying the photo. 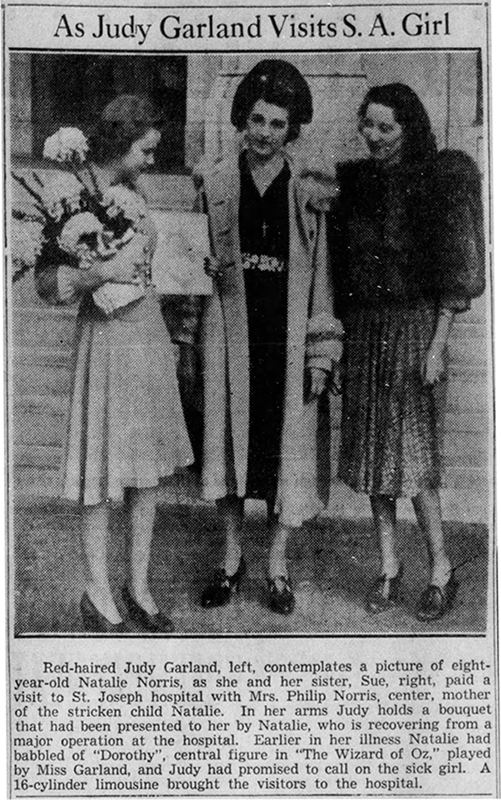 At this point, it was unusual for Judy’s sisters to accompany her on personal appearances, she was usually accompanied by her mother, Ethel Gumm. 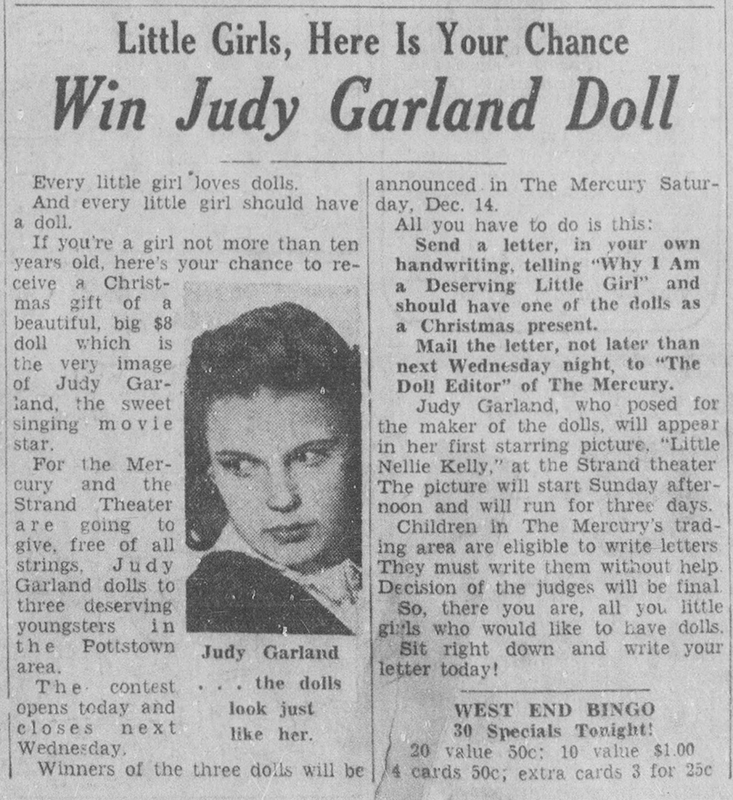 December 4, 1940: Three lucky little girls in the Pottstown, Pennsylvania, area got the chance to win a Judy Garland doll. 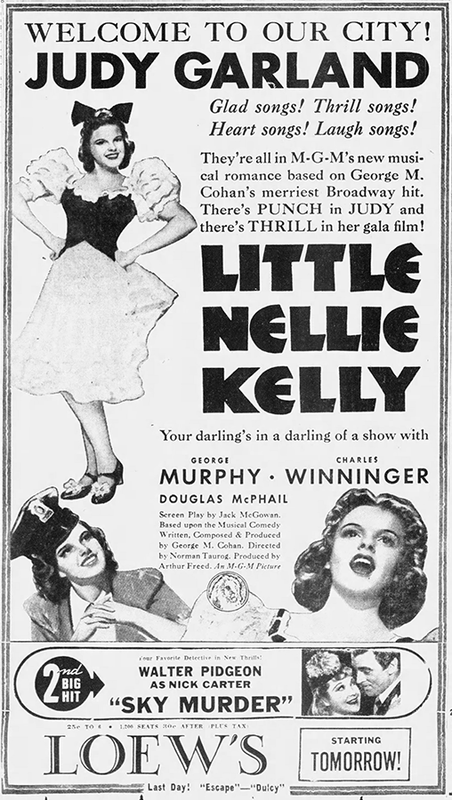 The contest was a tie-in to the upcoming engagement of Judy’s latest film, Little Nellie Kelly. Also shown above is a great ad for the film’s showing in Indianapolis, Indiana. 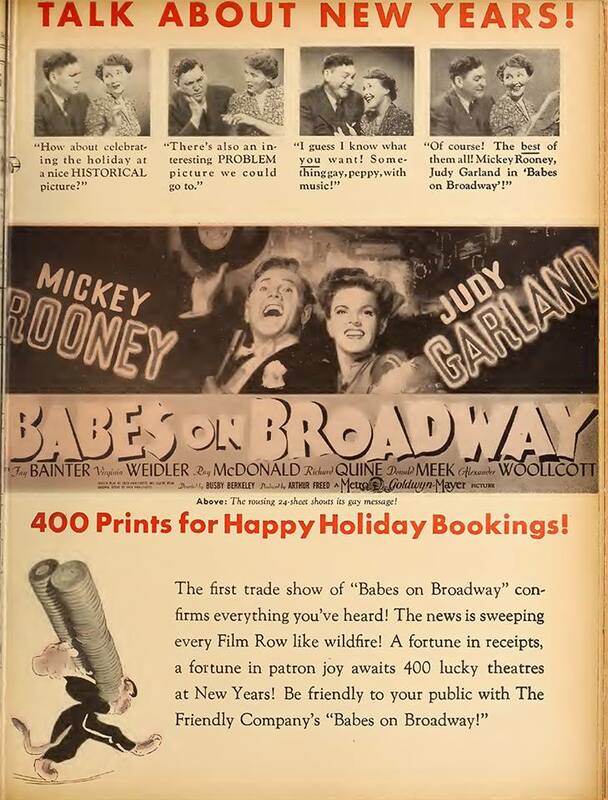 December 4, 1941: This ad appeared in the trade paper “The Film Daily.” Also in that same edition was a notice about MGM’s plans to star Judy and Mickey Rooney in Babes in Hollywood as a followup to Babes on Broadway. That never happened. 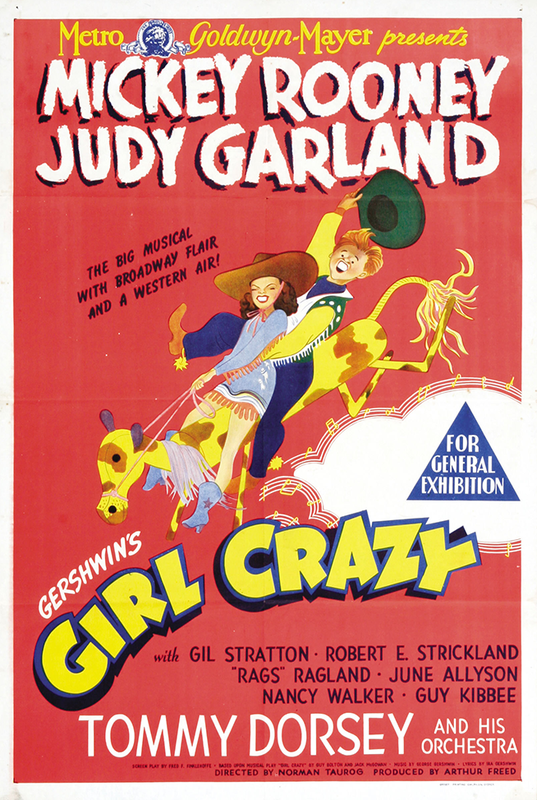 The duo’s next film was their last co-starring “Let’s Put On A Show” musical, Girl Crazy in 1943. 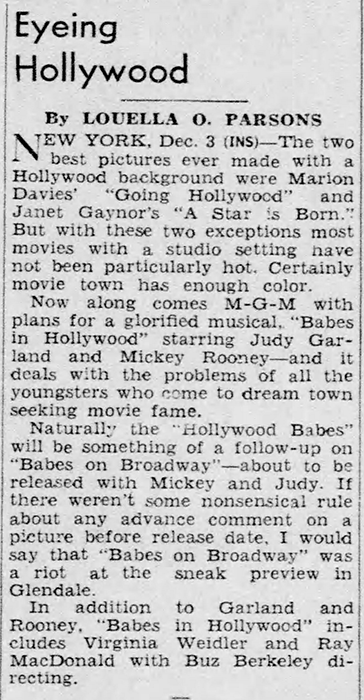 On this same date, Louella Parsons reported the same information. 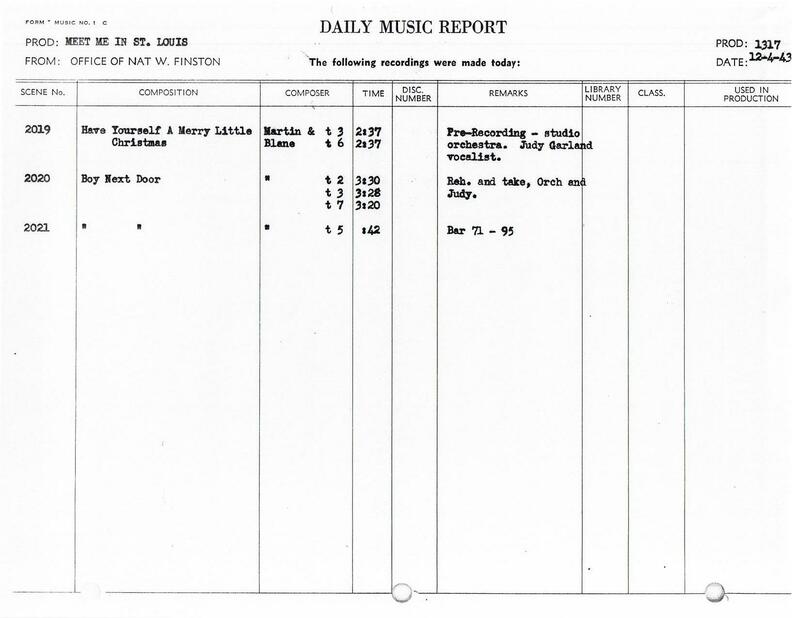 December 4, 1942: Judy had another music rehearsal day for Girl Crazy. She had the previous day off. Rehearsals definitely included the “I Got Rhythm” number although it’s not noted exactly which songs she rehearsed. On December 22nd she prerecorded “The Joint Is really Jumpin’ Down At Carnegie Hall” for her guest spot in Thousands Cheer, so it’s safe to assume that on one of these days she was rehearsing that number as well. 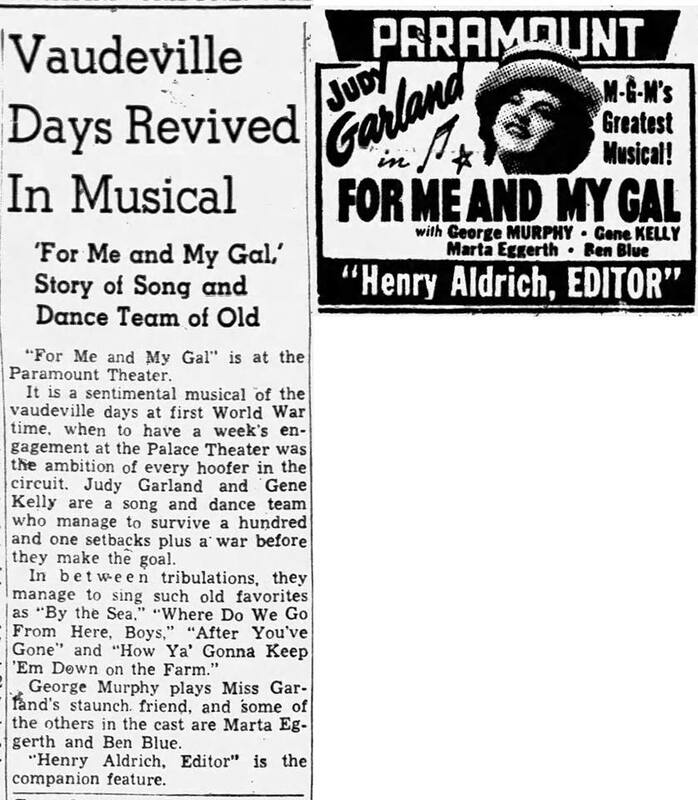 December 4, 1942: Here are a few more reviews for For Me And My Gal. 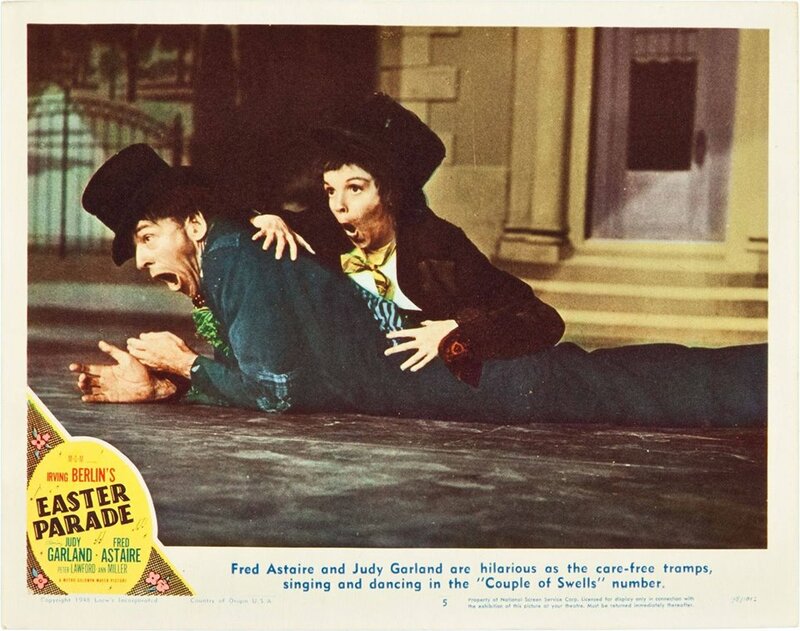 The film was earning raves especially for its depiction of the old Vaudeville years which many people still had fond memories of. 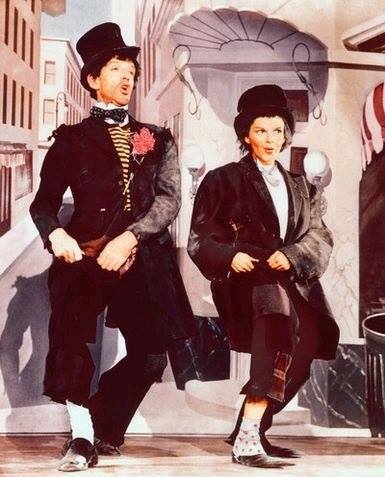 Dedicated to “the clown in the baggy pants, the lady who sang and the rabbit who disappeared,” “For Me and My Gal” pays nostalgic tribute to the golden era of vaudeville and the troupers of the old two-a-day whose dream was to play the Palace Theatre in New York. About the personal histories of three song-and-dance youngsters heading hopefully for the big time, M-G-M has built the glossy, sentimental, alternately humorous and tragic film which opened at the Boyd yesterday. It isn’t romance or vaudeville alone that keeps this dramatic musical spinning. 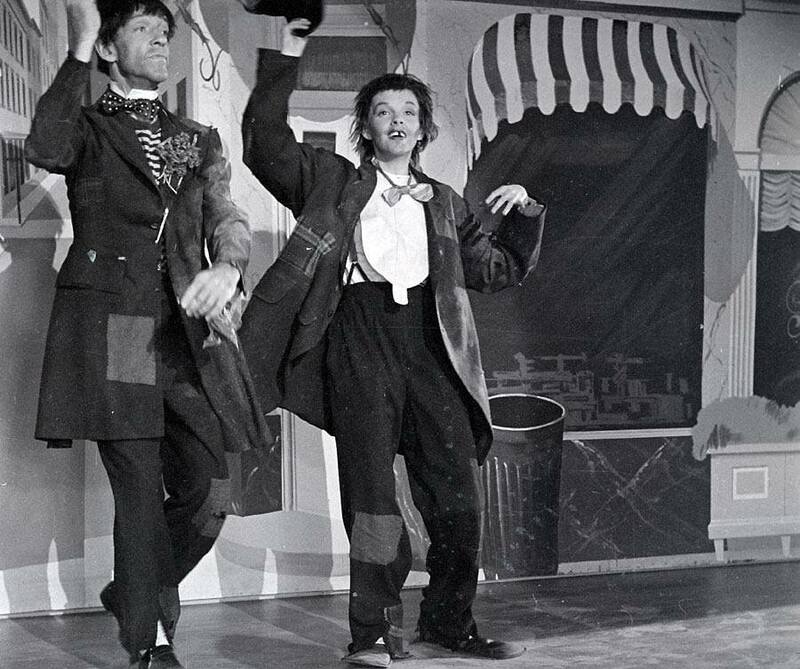 For behind the grease-paint and heart throbs is a war background and World War I plays an important part in the professional and private fortunes of Judy Garland, Gene Kelly and George Murphy, the talented and attractive principals. Basically, “For Me and My Gal” is one of those backstage triangles in which the heroine loves a hell while the really nice guy stands around hiding a broken heart and lending a stalwart shoulder upon which she can weep. More persuasive than the overburdened plot are the atmospheric trimmings, old songs and especially, the expert performances of the three stars. If the sentiment occasionally goes soggy, if the egotistical hoofer’s draft-dodging device is in questionable taste at this time and if his sudden transformation from heel to hero is implausible, it doesn’t particularly matter. For on the score of sheer entertainment, the picture has what it takes to please fans. 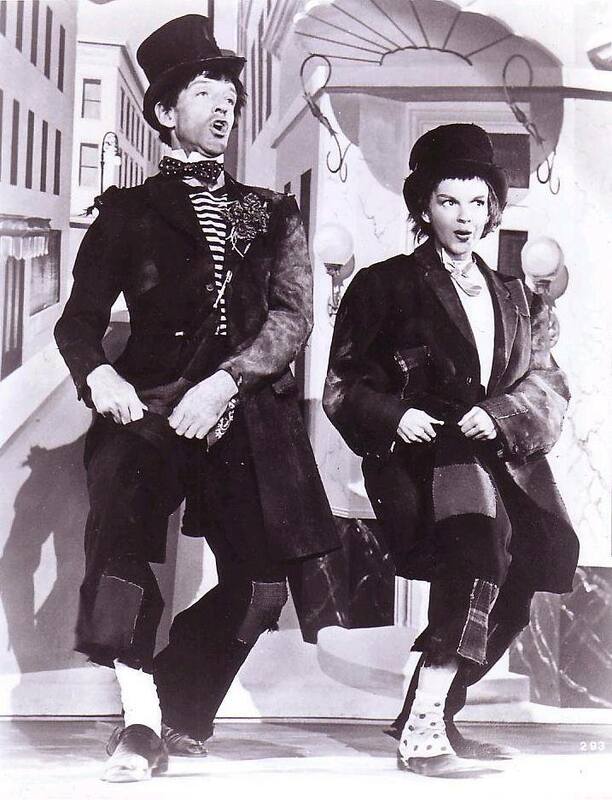 Judy Garland, vocally and dramatically, has never been better than as the young vaudevillian who leaves George Murphy’s act to team up with Gene Kelly and finds herself hopelessly in love with the ambitious rascal bent on being booked into the Palace whatever the cost. Murphy is his usual dependable self; but Kelly is the film’s surprise star and the answer to Hollywood’s cry for new faces. In a role similar to the sort of scamp he made popular in “Pal Joey” on the stage, Kelly’s Harry Palmer, for all his sins and even when the script insists on reforming him, is enormously effective. Pa Pitt can claim a brand new movie star this morning. 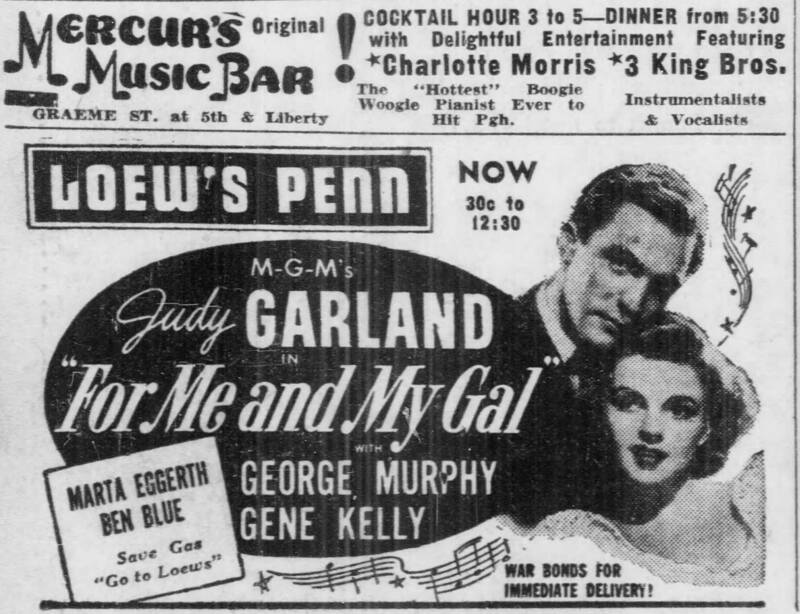 Kelly’s the game, Mr. Gene Kelly, and he’s terrific in the Penn’s “For Me and My Gal,” his very first picture. In fact, Hollywood hasn’t come up with a more string personality, or a young man with more on the ball, in a long time, a long, long time. Oh ho, you’re probably thinking, what would you expect Cohen to say? After all, they’re old friends, the Cohens and the Kellys, and then there’s the civic angle, too. Well, before you pre-judge the Old Massa’ and sniff at his praise of Kelly with suspicion, ankle down to the Penn yourself and get a load of the guy. Newcomers to the screen are usually a bit unsteady. But not Kelly. He runs through the picture as if he’d been in front of the cameras all his life, and this corner would be forced, in the interests of justice, fair play, life, liberty and the pursuit of happiness, to go all-out for him even if Mr. Elly hailed from Kalamazoo or Twin Forks. Incidentally, this is the first time the home town has been privileged to see Mr. Kelly since his fledgling days with the Cap and Gown Club at the Pittsburgh Playhouse. 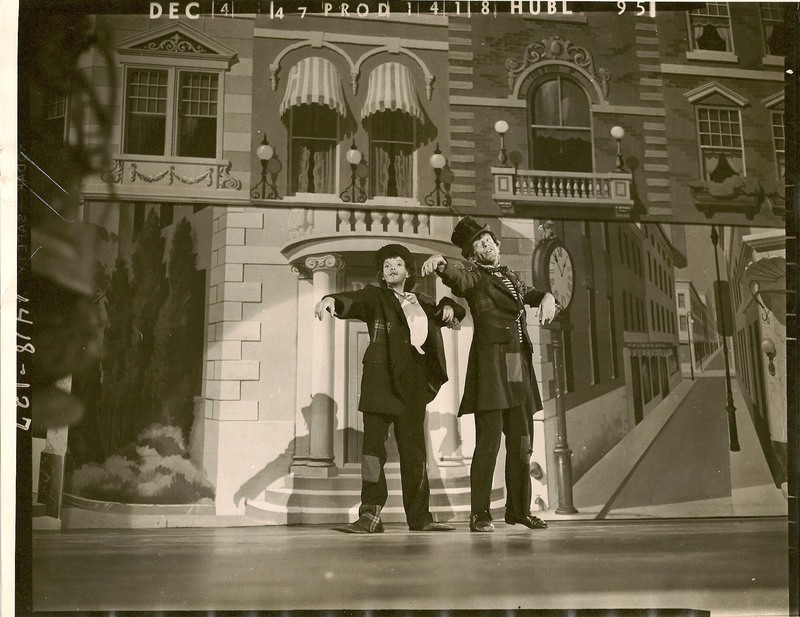 He had withdrawn from “The Time Of Your Life” in favor of his kid brother, Mr. Fred Kelly, when William Saroyan’s intriguing bar-room medley played the Nixon here a few seasons ago, and Mr. Georgie Tapps succeeded him in the “Pal Joey” before Mr. John O’Hara’s musical history of a hell got this far. 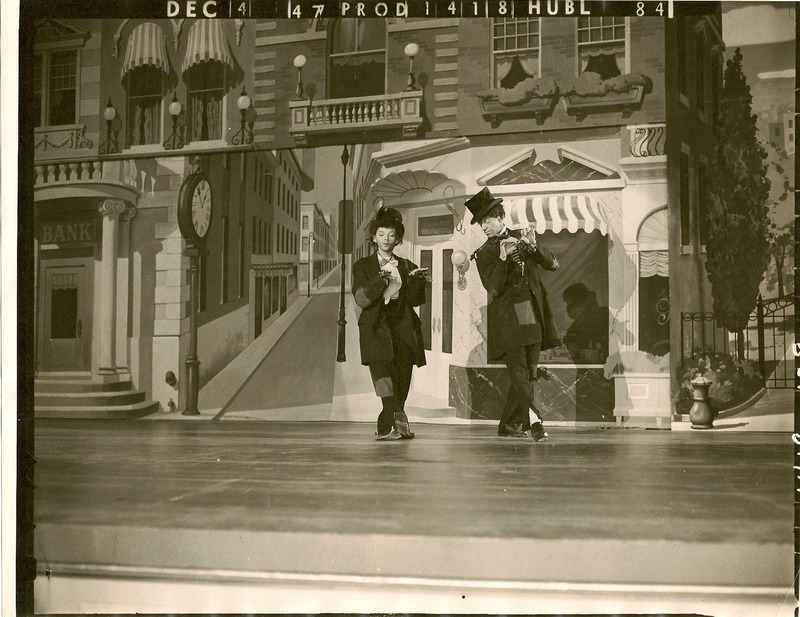 So “For Me and My Gal” really marks his professional debut in these precincts, and you can’t imagine how happy it makes your corresponded and Mr. Kelly’s friend to be able to shoot the works for the dancing Irishman, who not only dances brilliantly but also sings pleasantly and acts with the best of them in shaping a complex character. And now for “For Me and My Gal” itself. It’s a sentimental salute to pre-war (World I) vaudeville, when the New York Place was the goal of every broken-down hoofer and “You Great Big Beautiful Doll” was sweeping the country. Miss Judy Garland is the girl who falls in love with an engaging no-good (Mr. Kelly) and follows him through selfish think and trying thin, and the narrative is dragged out a little too much and gets painfully maudlin in the last couple of reels, but the backstage atmosphere is so authentic and the nostalgia for old songs and old places is so accurate that the script’s failings don’t weigh too heavily against it. At that the last couple of reels could have been scissored ruthlessly or eliminated altogether. They extends [sic] “For Me and My Gal” far beyond its natural limits, and the hero stuff is dragged in by its heels. 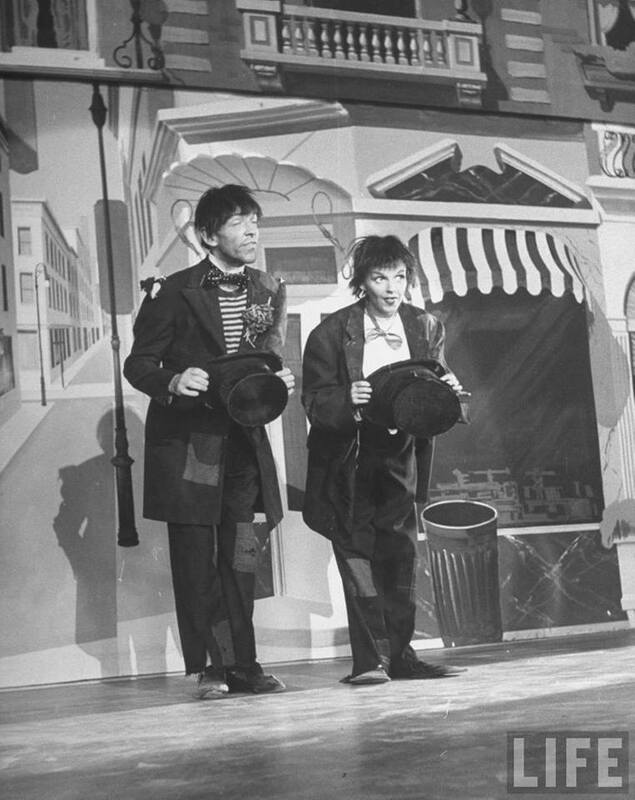 But up to the point where Mr. Kelly smashed his hand so he can beat the draft for a few more weeks and play the Palace, “For Me and My Gal” is an entertaining nosegay in which the two young stars fill the screen with humor and sentiment, and the hit tunes of 25 years ago cast a spell of pleasant peace and contentment. And how that Miss Garland sings them! There isn’t a better song-plugger in all of show business or a more captivating ingenue. If talent means anything at all in Hollywood, Gene Kelly, Pittsburgh’s most recent contribution to the motion picture industry can settle down in the film colony for just as long as he likes. The likable young Pittsburgh is that good. Gene proves that he’s a “natural” in “For Me and My Gal” which opened at Loew’s Penn yesterday and it’s more than civic pride that prompts me to say that he steals the show. When a newcomer takes honors from such capable hands as Judy Garland and George Murphy, that’s pretty nice stealing. Except for the fact that the picture runs wild near the end, “For Me and My Gal” is pretty swell entertainment. It’s a tale of the great days of vaudeville when every act, even though it’s biggest booking was Slip Noose, Wyo., was dreaming of the day when it would be booked into the palace [sic]. This story concerns Harry Palmer, somewhat of a heel, and Jo Hayden, a singer in Jimmy Metcalfe’s act. 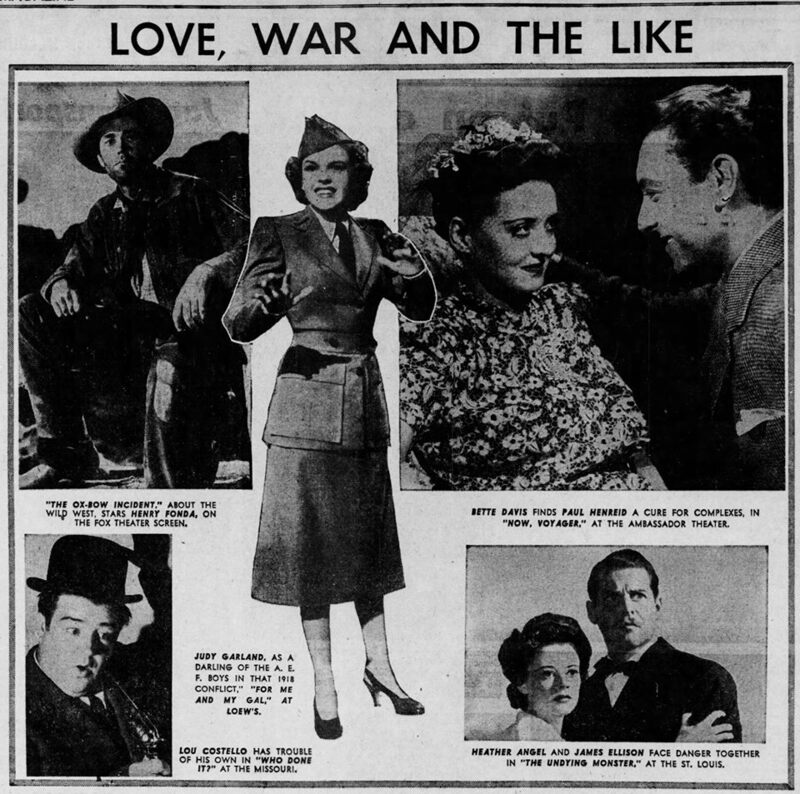 The two meet in a tank town where both acts are on the bill and Harry falls in love with Jo. Jo means almost as much to him as a chance at the big time. Naturally she dislikes him at first but he sells her on the idea of joining him in an act that was bound to click. Then comes World War I and just when their big opportunity, a week a the Palace, is set, Harry gets his draft summons. He deliberately injures his hand so that he can play the theater which has been his life’s ambition but Jo breaks with him when she finds that he has tried to escape service. Of course, as in many movie scripts, the picture then takes too much footage to justify our hero and things gets [sic] pretty much out of hand but before that happens young Mr. Kelly is “in.” His dancing, singing and acting deserve prolonged cheers. 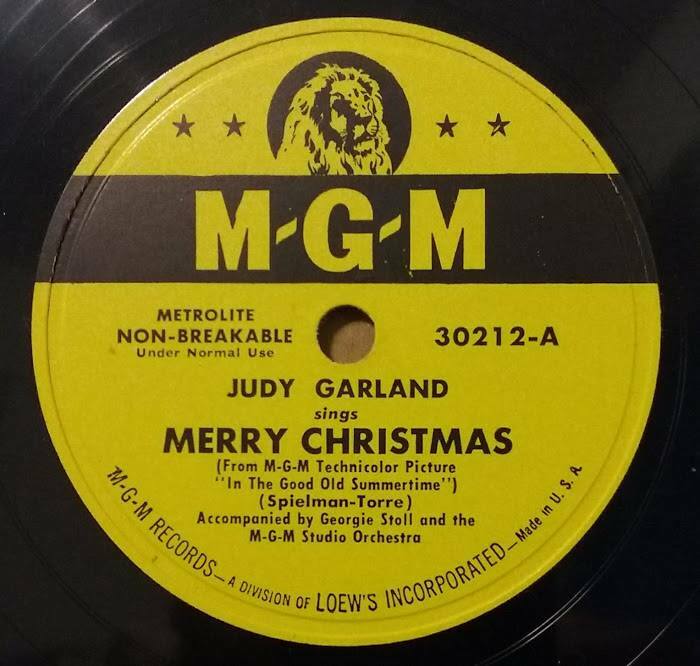 Judy Garland sings a number of songs that were on the 1916-17-18 Hit Parade and they sound pretty fine. Miss Garland also proves to be a pretty fine partner for Mr. Kelly in several dance routines. The attempt to make Judy into an Elsie Janis is overdone but Miss Garland has established herself solidly by that time. George Murphy has a rather sappy role but any time the movie directors give George an opportunity to dance, he is sure to be all right. Ben Blue is funnier in this picture than he has been on the screen or in person in a long time and Marta Eggerth does very well in a not-too-meaty part. But it’s Gene Kelly’s picture and Gene makes good. “For Me and My Gal” is for everybody and MGM would do well to keep Mr. Kelly busy. The movies are “duck soup” for him. 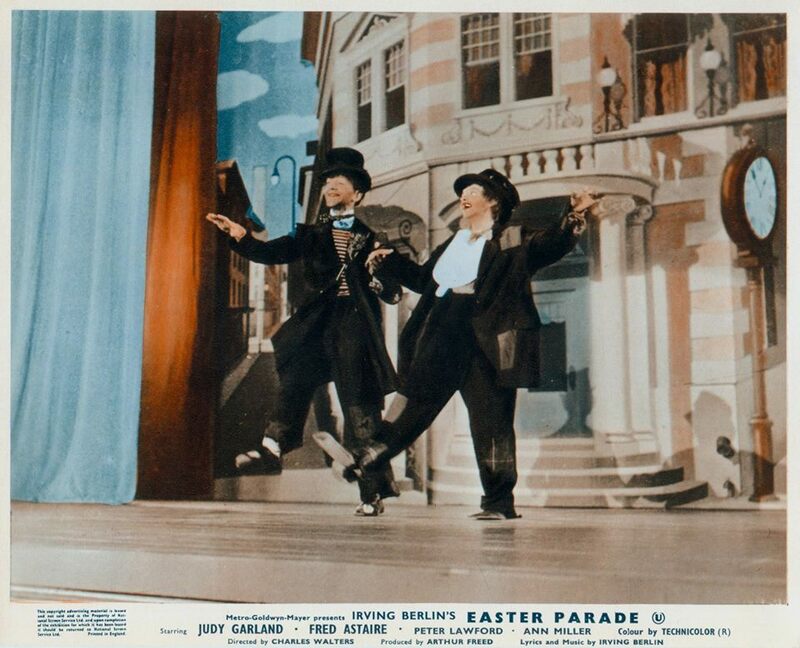 December 4, 1947: The second of two days of filming for Judy and co-star Fred Astaire on the “Interior Globe Theater” set for Easter Parade – the now-famous “A Couple Of Swells” number, which is one of the best numbers Judy (and Fred) ever put on film. 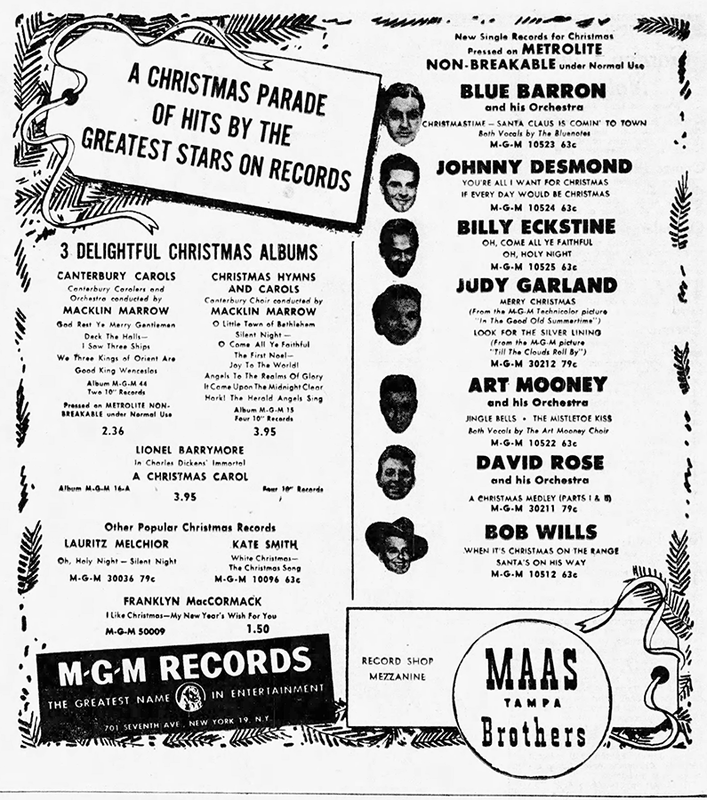 December 4, 1949: “Candied vs Candid” plus an MGM Records ad. Label image from The Rick Smith Collection. Thanks, Rick! 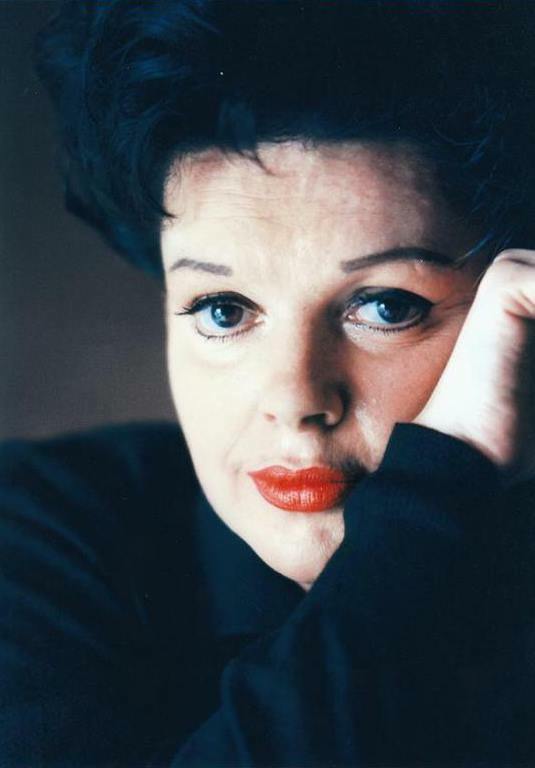 Check out The Judy Garland Online Discography’s In The Good Old Summertime pages here. December 4, 1953: The first of two days of filming the “Here’s What I’m Here For” sequence for A Star Is Born on the “Interior Recording Stage” set. Each day started at 10 a.m. with the first day finishing at 5:15 p.m., the second finishing at 5:30 p.m. This entire sequence was cut from the film when Jack Warner butchered it. Luckily, the footage was found and inserted back in for the 1983 premiere of the restored version. Some photos provided by Kim Lundgreen. Thanks, Kim! 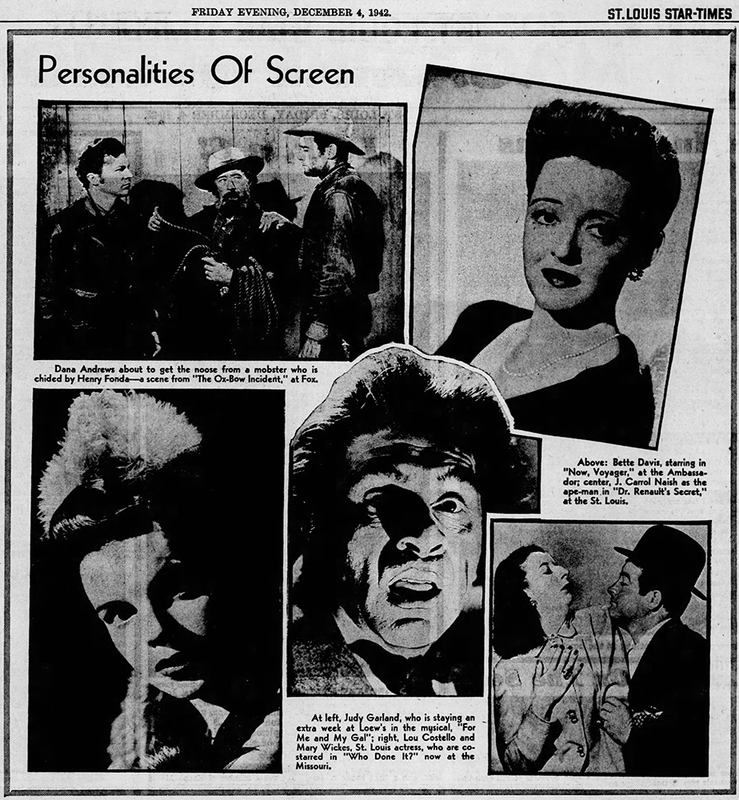 December 4, 1954: More for A Star Is Born, including a nice blurb about the film’s soundtrack album. This photo was taken backstage after the show. 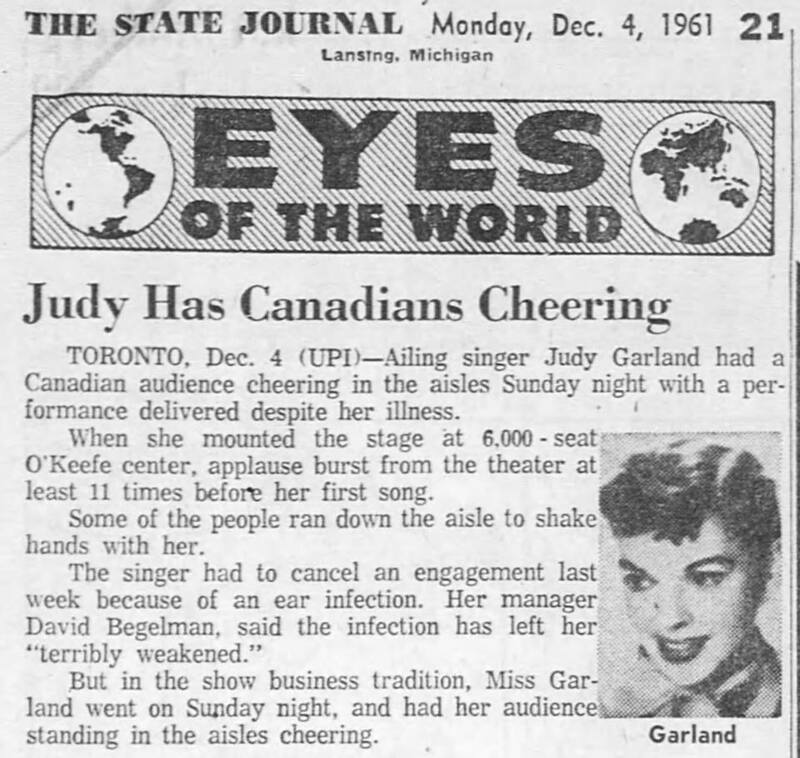 December 4, 1961: Judy wowed them at the O’Keefe Center, Toronto, Canada the previous night (December 3, 1961). 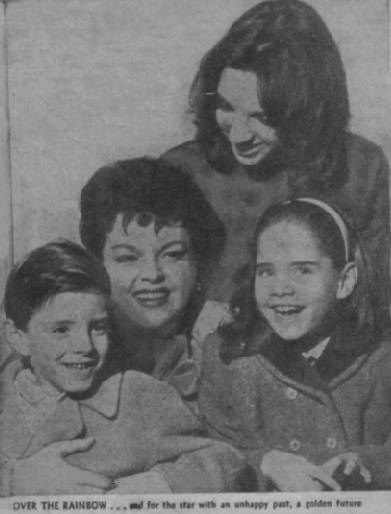 December 4, 1961: Judy had everyone in the palm of her hand. December 4, 1967: Judy was in the middle of her run at Caesar’s Palace in Las Vegas, Nevada, when she canceled this night’s show. The reason for the cancelation was her grief over the death of Bert Lahr, her beloved Cowardly Lion in The Wizard of Oz. 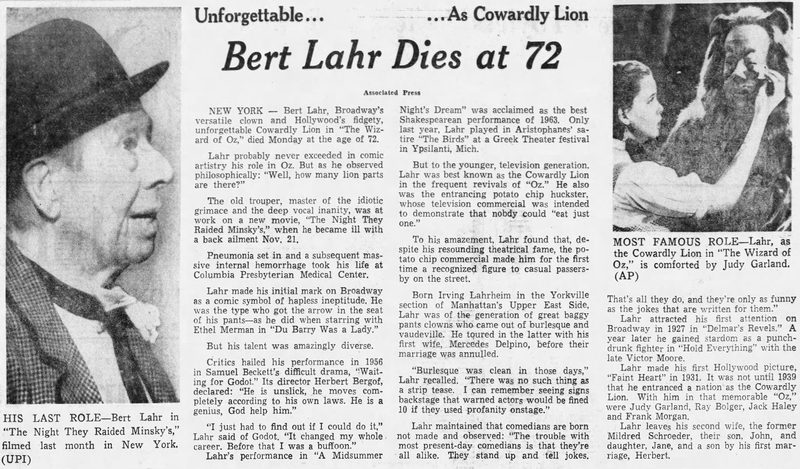 Lahr was 72. December 4, 1968: Judy was released from the hospital. later that afternoon/early evening John Meyer visited with Jenny Wheeler who was close to mononucleosis and was going down South, for a long rest. About 7:30 p.m., Judy managed to get Ken Darrell of the Furniture company of America to deliver a Baldwin spinet to her apartment. Judy started singing, Ken had his girlfriend over, and by 9:30 p.m. they were having a party, which ended at about 1:00 a.m.